On An Overgrown Path: What's in a name? Hip hop, trance, house, dance, techno and electro aren't just categories of rock music. They are fan bases, communities, underground networks, marketing tools and cultural directions. And more importantly they are self-contained markets which combine to form a thriving scene for new rock music. In classical music we have the tried but dry categories of early, baroque, classical and romantic, but after that things become difficult. Until eight years ago twentieth-century music was a useful fallback, but should Mahler be in the same category as Boulez? Then there is modern music, but that sounds like furniture, and avant-garde which sounds forbidding. How about contemporary and new music? 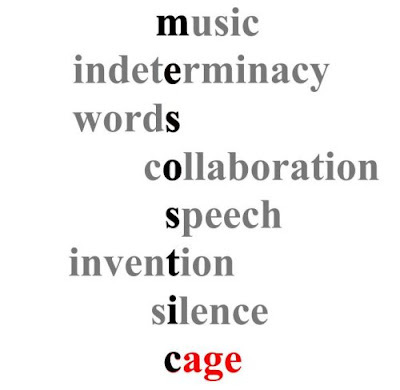 But is John Cage, who died sixteen years ago, contemporary? Is Britten as contemporary as Christina Kubisch? Or is Stimmung, which was composed forty years ago, new music? Then there are experimental, aleatoric, chance, electronic, atonal, serial, minimalist and other technical labels which sound just like what they are, technical labels. It's not an academic discussion. We want new audiences and knowing what to call something is the first step towards liking it. Which is why BlackBerry, PowerBook and iPod are much more than mere names. Future Radio bills my programme as contemporary classical and on this blog and on air I use the default of contemporary music or new music. But I keep thinking there must be something more compelling and descriptive to stand alongside hip hop trance, house, dance, techno and electro. Is there? Or doesn't it matter? Now read about a title given by the gods. People, mostly men, like puttings things in neat pigeon-holes. I don’t. As I like the broad perspective. New Music is about adventures. Anyway that’s a major part of it. I use the term "underground classical" at my blog, modernclassical.blogspot.com, because I could not think of a better term. I agree a good "branding label" would be useful in promotion modern music.